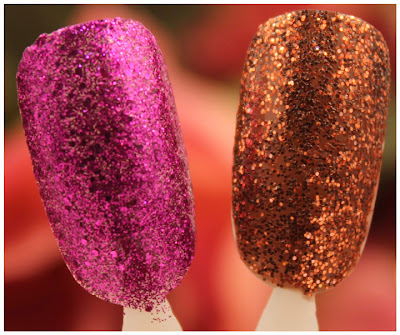 These two polishes are from the Mac Temperature Rising Collection. My first reaction when I saw these was that I already had something like these in my collection, but then I checked out the glitters I have and nope..... nothing that comes even close. 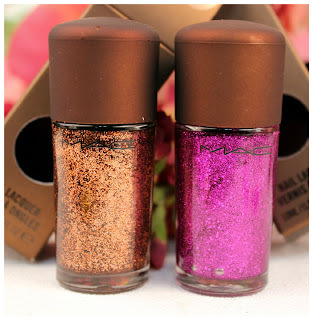 These are the only two Mac nail polishes that I own, I just never got interested in their polishes for some reason. Left - Scorching Haute Right - Tropical Scorching Haute is a very pretty dark fuchsia glitter that sparkles like crazy! Tropical is a very pretty Bronze color with gold and orange glitter particles mixed in. I think if Mac comes out with more glitters.... I will definitely become addicted!